"to write about disability and rail against the discrimination that disabled people continue to face." One in five Americans lives with a disability. The next time you are in public, look around you. One in five of the people you see will have a documented disability. It could be a chronic illness like multiple sclerosis or AIDS; it could be a hidden disability like ADD (or AIDS); it could be a visible disability like cerebral palsy or Down syndrome; it could be a disability that prevents that person from learning easily, or hearing or seeing; it could mean something obvious like being a wheel chair user but it could also be something hidden like depression or mental illness. Whatever that disability is, whether you can recognize it or see it or not, remember the number. But as you can see, when there is a problem with our children, we actually get LESS support sometimes than a nondisabled family would. We even have to fight for our rights to take care of the problem ourselves sometimes. We have to prove that the problem is just a typical childhood thing and not due to our disabilities. We are on our own a whole lot. Support is sometimes rare. What I know from first-hand and some pretty darned close second-hand experience is the problems disabled kids face in education, especially in the primary (kindergarten through sixth grade, roughly). In the United States, our system of educating teachers is failing to prepare them to teach students to read. This burden falls particularly heavily on students with specific learning disabilities in reading. 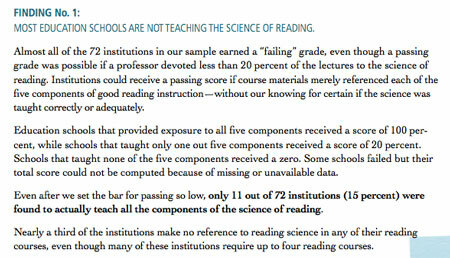 Last year, the National Council on Teacher Quality published an extensive study of the curricula on reading in a statistically valid sample of schools of education in the United States. Download the PDF of the executive summary. The Six Types of Syllables that compose English words are taught next. If students know what type of syllable they're looking at, they'll know what sound the vowel will make. Conversely, when they hear a vowel sound, they'll know how the syllable must be spelled to make that sound. Roots and Affixes as well as Morphology are then taught to expand a student's vocabulary and ability to comprehend (and spell) unfamiliar words. For instance, once a student has been taught that the Latin root TRACT means pull, and a student knows the various Latin affixes, the student can figure out that retract means pull again, contract means pull together, subtract means pull away (or pull under), while tractor means a machine that pulls. Research has shown that dyslexic people who use all of their senses when they learn (visual, auditory, tactile, and kinesthetic) are better able to store and retrieve the information. So a beginning dyslexic student might see the letter A, say its name and sound, and write it in the air -- all at the same time. Direct, Explicit Instruction: dyslexic students do not automatically "get" anything about the reading task, and may not generalize well. Therefore, each detail of every rule that governs written language needs to be taught directly, one rule at a time. Then the rule needs to be practices until the student has demonstrated that she has mastered the rule in both receptive (reading) and productive (writing and spelling) aspects. Only then should the tutor introduce the next rule. Systematic and Cumulative Many dyslexic students are not identified until later in their academic careers. They have developed mental "structures" of how English works that are completely wrong. To develop good written language skills--reading and writing--the tutor must go back to the very beginning and rebuild the student's mastery with a solid foundation that has no holes or cracks. The student must learn the the logic behind our language, by encountering one rule at a time and practicing it until the use of the rule is automatic and fluent when both reading and writing (spelling). The student must learn to connect previously learned rules into current challenges. NOW WHAT? There are a number of places to get help. The International Dyslexia Association can help, as can LD Online and Schwab Learning Susie Barton has a very helpful site. Powerful. Thanks for linking to me and offering these statistics. Bravo. Increasingly, even our public spaces are highly segregated by how controlled a person’s behavior is: there are an increasing number of public places such as stores, restaurants, museums, where it is now considered okay to pressure children displaying normal behavior, and people who are different in ways that might express itself as impulsiveness or an occasional squawk — to begone and shut themselves away so they don’t bother The Real People. Yes, there have always been places restricted to only adults, or that required quiet. It’s just that it has now spread to Papa Gino’s and the supermarket. This creates the market for kid-ghettos like Chuck E. Cheese’s. And people over 4 feet tall who are different? Where are they welcome? But do we really want an age-segregated society? A neurologically segregated society? How has that worked out for children and elders? — who we have all been, and with luck all will be? What about the people who care for children and elders? How has this enforced isolation worked out for them? How has that isolation worked out for people who aren’t neurotypical and the people who care for them? Voting no against a society that’s segregated by age and neurobiology doesn’t mean letting infants into the symphony. It means hearing a kid wailing in Target — and refraining from the dirty look. It means getting in line behind someone who needs reading glasses and help with their supermarket cart and shrugging it off if it takes more time for them to check out than a teenager on crank. It means making space for people who are not neurotypical of any age.